eQSL recebido: G0AJH, Hornchurch, England, 28 MHz, QSO w/ LT0H (WAE SSB Contest 2012). eQSL recebido: N5XED, Benbrook, TX, United States, 21 MHz, QSO w/ YV4DNN. 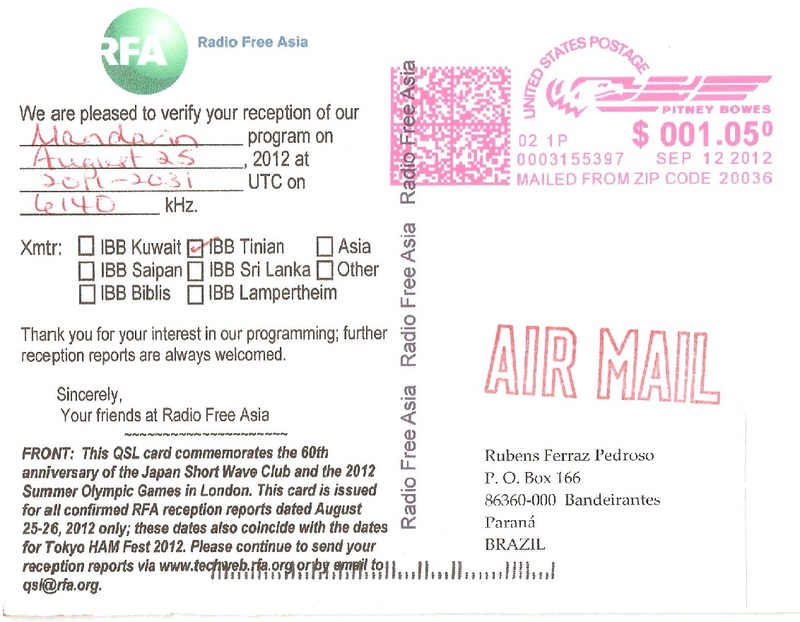 Confirmação recebida: 6.140 kHz – Radio Free Asia – Tinian Island/MRA. 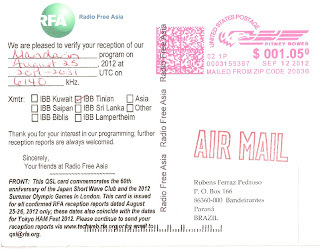 Radio Free Asia, 6.140 kHz – Tinian Island/MRA. 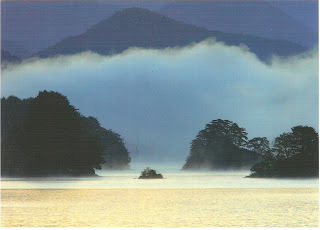 (Rx: Redsun RP300 /Ant: RC3-FM). eQSL recebido: CX3AT, Montevideo, Uruguay, 21 MHz, QSO w/ XQ7HL. Cartão QSL recebido: PA3DBS, Halsteren, The Netherlands, 21 MHz, QSO w/ L33M. 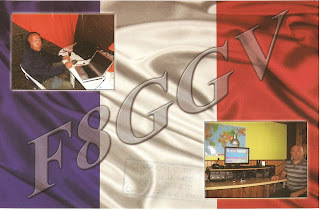 Cartão QSL recebido: F8GGV, Sevran, France, 14 MHz, QSO w/ PY6RT. 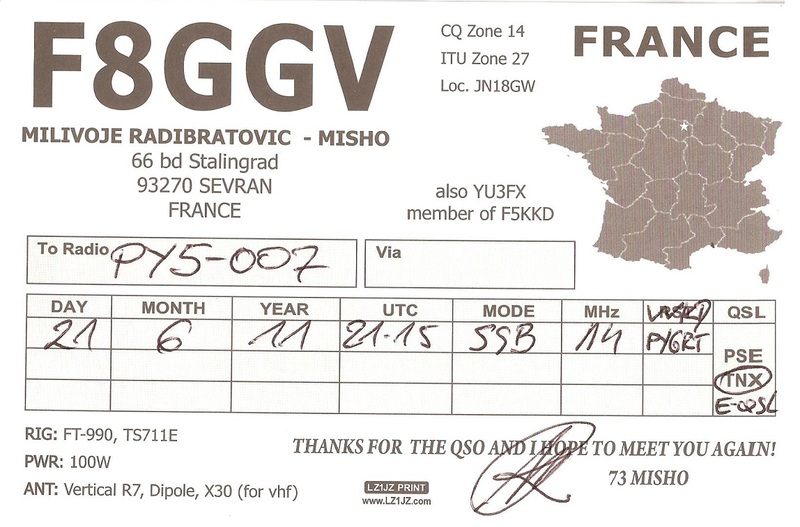 eQSL recebido: IZ5EME, Grosseto, Italy, 7 MHz, QSO w/ PX5E (WAE SSB Contest 2012). 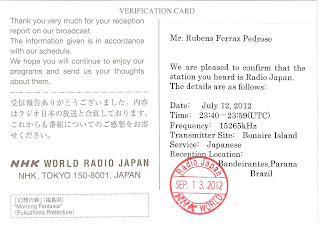 Confirmação recebida: 15.265 kHz – Radio Japan – Bonaire/ATN. 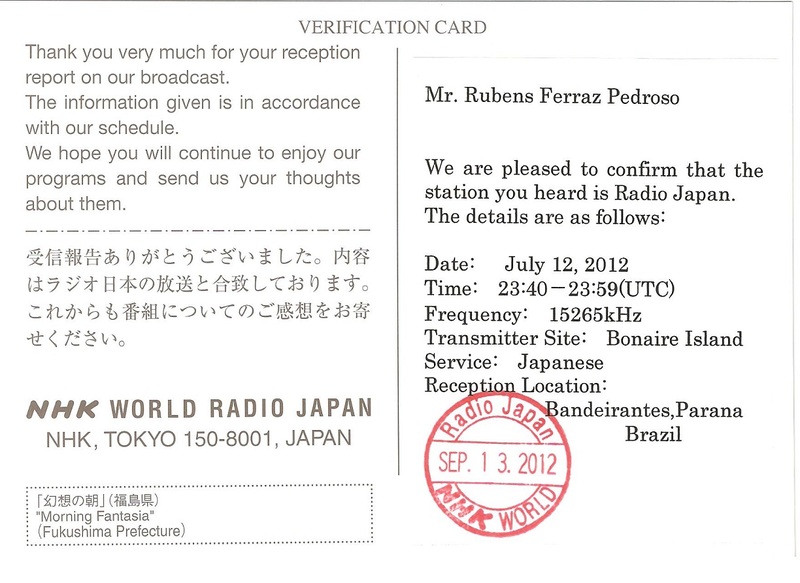 Radio Japan, 15.265 kHz – Bonaire/ATN. (Rx: Sony ICF SW 7600G /Ant: RC3-FM). eQSL recebido: CT2HTM, V.N. Familação, Portugal, 21 MHz (banda correta), QSO w/ LU9MBY. 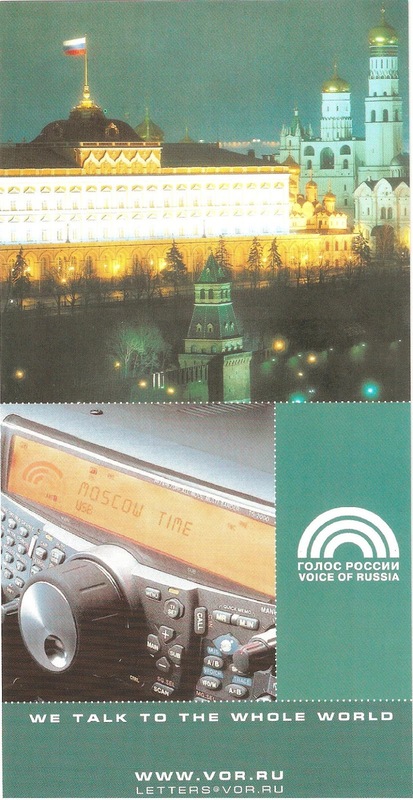 Confirmação recebida: 12.060 kHz – Voice of Russia – Yerevan-Gavar/ARM. 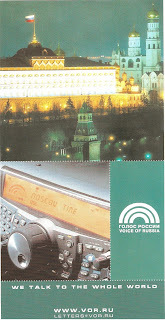 Voice of Russia, 12.060 kHz – Yerevan-Gavar/ARM. 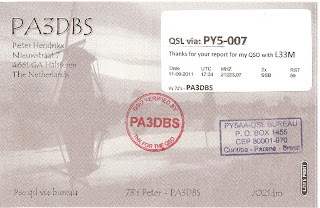 eQSL recebido: DL1TKB, Ense, Germany, 7 MHz, QSO w/ PX5E (WAE SSB Contest 2012). 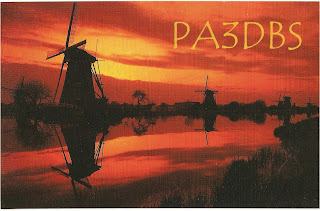 eQSL recebido: DK2PZ, Muenchen-Gasbrunn, Germany, 28 MHz, QSO w/ CE3PG (WAE SSB Contest 2012). eQSL recebido: IZ1TUG, Alessandria, Italy, 28 MHz, QSO w/ CE4WJK. eQSL recebido: EA5FWW, Murcia, Spain, 28 MHz, QSO w/ CE4WJK. 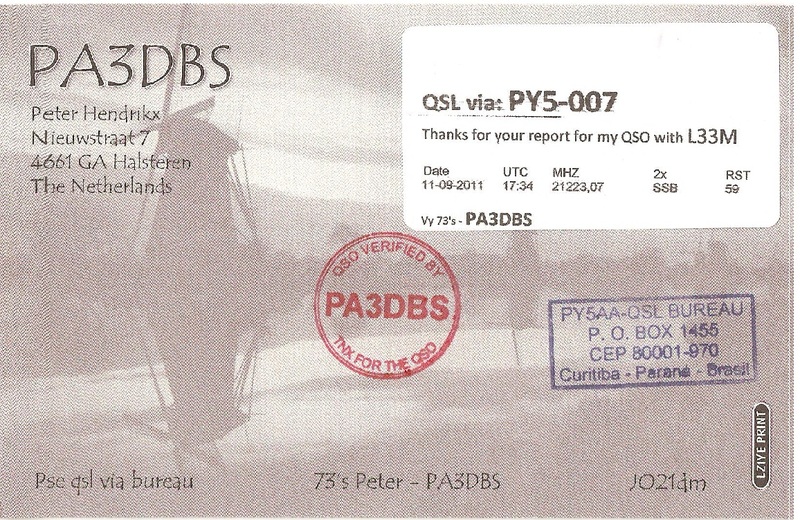 eQSL recebido: PY7ZER, Recife, PE, Brasil, 21 MHz, QSO w/ M3GFQ. 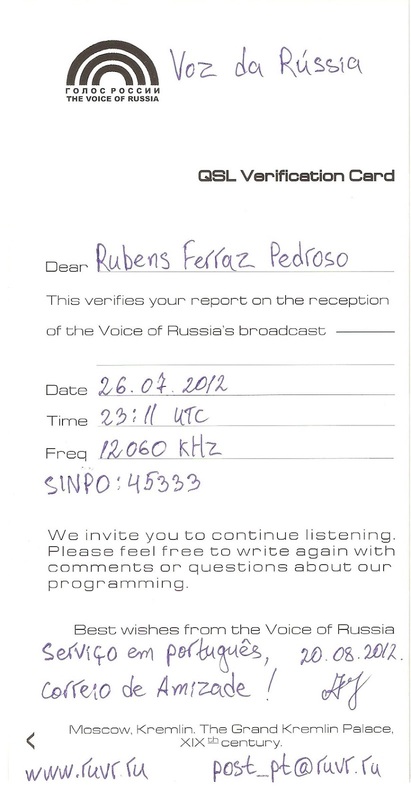 eQSL recebido: R1A-125 CW SWL, Saint Petersburg, Russia. 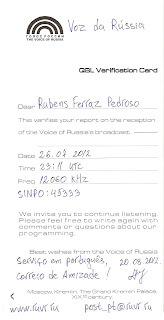 Obs: Não enviei meu eQSL para esse radioamador russo, mas mesmo assim ele me enviou o dele. Pelo que entendi ele quer ser meu amigo e o mesmo também é SWL. 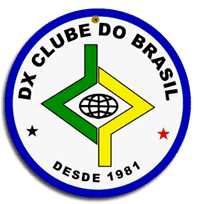 Como ele me descobriu? Talvez através do meu blog. 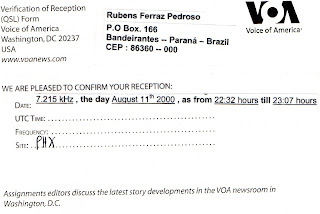 Confirmação recebida: 7.215 kHz – Voice of America Philippines Relay Station – Tinang/PHL. VOA Philippines Relay Station, 7.215 kHz – Tinang/PHL. 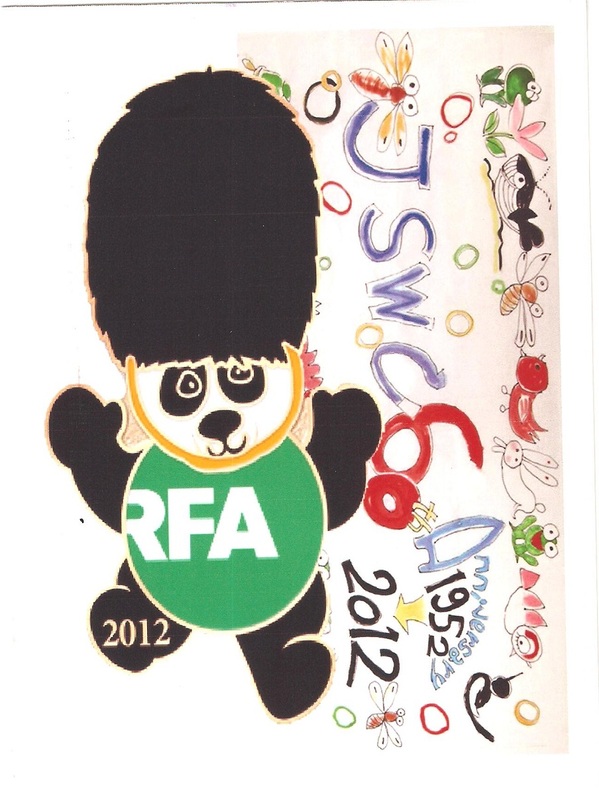 (Rx: Sony ICF SW 7600G /Ant: Longwire). 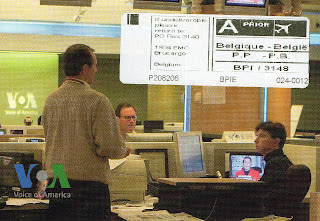 E-mail recebido da Voice of America Philippines Relay Station – Tinang/PHL. appears to have been such a transmission 12 years ago. 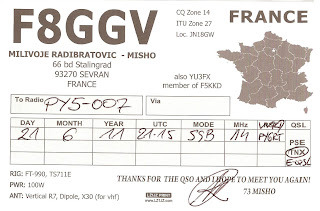 eQSL recebido: F6DXE, Scaër, France, 7 MHz, QSO w/ LU1IV. eQSL recebido: AL7TC, Palmer, AK, United States, 28 MHz, QSO w/ WL7E.